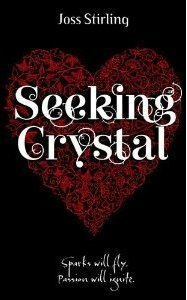 Seeking Crystal is (so far) the last installment of the Benedicts series by Joss Stirling. Her next full length novel will be 'Storm & Stone', but no further details are known yet. So this is the first end of Saturday Series, next week will be a special about J.R. Ward's Black Dagger Brotherhood in honor of her latest release 'Lover At Last'. Crystal is the seventh child in a Savant family and that usually means she is a bit more special and powerful than the rest. She might be extra special, but not extra powerful. Instead of having all these amazing abilities, she can't event communicate telepathically, which is a basic Savant power. It is also one of the only ways to know if you've met your soulfinder. The only thing Crystal can do is find lost items, like your keys or that scarf you've misplaced. So besides being a huge letdown (that's what she thinks of herself), she will also never find that one true love. But right now that's not even on her mind. She recently graduated high school (barely) and has no clue what she wants to do with her life, so now she's travelling with her sister Diamond to all these Savant conferences. Unlike Crystal, Diamond does have a Savant power, best described as being a mediator, but on a whole new level. This is where they literally run into Trace Benedict and Diamond and him plan on getting married. Since Crystal and Diamond live in Venice, they decide on getting married there. While Diamond stays behind, Crystal flies back home and starts working at Signora Carriera as a costume maker. Carnaval is coming up so times are busy. Soon she is joined by Trace's brother, Xav, who she thinks is the most annoying person ever (putting it mildly). They both have to plan their brother and sister's bachelor(ette) party and seeing as they are now living in the same house, they are spending a lot of time together. Their friendship grows, but they both know it can never be more as they can't know if they are soulfinders. Soon the entire family arrives in Italy, but as always having the entire Benedict family together makes them vulnerable for their enemies. They really do have enemies all over the world. Before you know it people are attacked, go missing or other misfortunes are happening. So definitely exciting and a lot of action. For Crystal it might even be a good thing in the end. I can't say anything more without giving away big spoilers, but it's funny, exciting, mysterious and romantic. The setting of the story is also beautiful, I've been to Venice and I think it's definitely an advantage if you really know how it looks and can remember the atmosphere of the city. Joss Stirling has done a wonderful job on translating that to the pages. Click here for the review of Finding Sky (Benedicts #1) & Stealing Phoenix (Benedicts #2).